For a quality home theater surround sound, you should set up a surround speaker system so that the sound reaches the audience in the best quality possible. Projectors are a versatile way to amplify the image at home, at the office, in cinema halls and when making any presentation. For example, projectors work with TV boxes, Laptops, gaming consoles and digital motion images over a network. In a theater configuration (used in large halls and cinemas) there is a multi-speaker setup and multi-channel recording where speakers are placed strategically across the room to recreate most sound sources. As a result, the audience receives a combination of signals emanating from different corners of the room. In large halls, the front of hall loudspeakers is placed on the right, left, and at the center front of the hall facing the audience. Especially relevant the surround speakers are placed in the middle of the sidewalls. They may also be placed at equal intervals from the front to the back at an angle of 45 degrees from the wall. Distributed loudspeakers are ceiling mounted at an angle of 30-45 degrees to the ground at strategic locations to enhance sound for the middle and rear seating. The surround system also requires mixing consoles, signal processors, and amplification systems to enhance the quality of the signal. Home theaters are commonly used in small rooms and living rooms. Almost all of them come in the configurations of 5.1 and 7.1 sound standards. While the 5.1 surround is the most popular, it has five speakers and subwoofers. The 7.1 surround has seven speakers along with the subwoofers. First of all, place the center channel speaker pointing directly to the ears height of the audience. 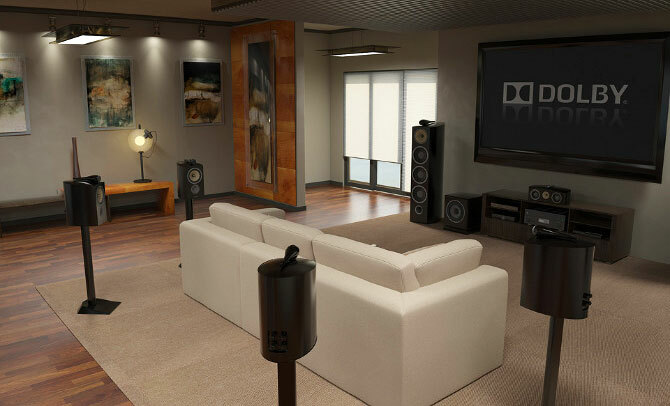 For an ideal home theater surround sound setup, it should be at least two meters away. The front left and right speakers should be placed at an ear’s height and produce 45 degrees angle when viewed from the seating. Ultimately, this helps in precise delivery of the sounds. The surround right and left speakers should be placed between 90 degrees to 110 degrees from each other. They should also be at least two feet higher than the ear’s height. If you have a single subwoofer, place it in the middle of the front wall. If you have two subwoofers, place them in the middle of opposing walls. The extra two speakers available in the 7.1 surround system should be placed in the middle of the room, two feet above the audience ears facing each other. Use HDMI ports for the connection of the sound and to the projector if present. HDMI supports surround sound and 3D quality images. Most receivers have HDMI in and out ports. The ‘in port connects to the source of the signals and the ‘HDMI out’ connects to the projector. If this is not available, use RCA cables to connect the sound from the source to the receiver.